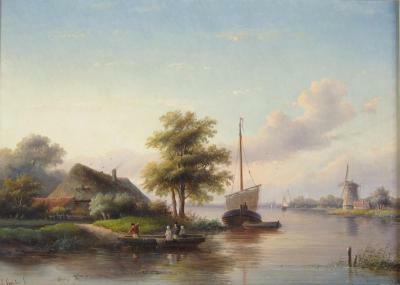 Spohler was a popular artist during his life and his work sold well. He studied under the renowned 19th century painter J.W. Pieneman (1779-1853) at the Amsterdam Academy of Arts and devoted his life to the portrayal of the Dutch landscape. He was best known for his fresh colours and excellent execution of light in his summer and winter landscapes. He painted during the height of the Du . . .